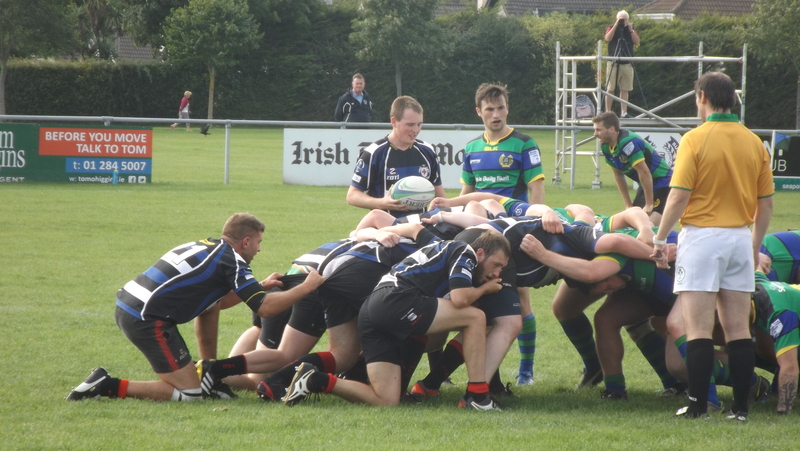 Tullamore edged out In AIL opener. A game Tullamore could and probably should have won, slipped away in the final quarter as a combination of ill-discipline, inexperience, bad luck and a faltering set piece saw Seapoint edge the win. Coaches Kenny & Burns will rue this result as one that got away. With a little more composure and some more solidity at the scrum, Tullamore would surely have claimed a vital and hard earned away opening day result. As it was a losing bonus point was the least their endevours deserved. Missing a clutch of seasoned veterans; Tullamore started with no fewer than 3 of last year’s U18 squad, while a further 3 sat on the bench. Steve Pyke, Sean McCabe, Eoin Farrell and Glen Bagnall all making their AIL debuts, while Barry Bracken was introduced at half time for his first taste of senior league action. Pyke worked hard and had some good moments, while McCabe was superb at 15 and looks a hugely exciting prospect. Tullamore started brightly and were on the front foot for much of the first quarter. A series of drives from a lineout maul by returning Captain Rob Connor, prop Molloy and Feighery set the platform and after Seapoint strayed offside, Dunne nailed the penalty attempt for a 3 – 0 lead. Seapoint rallied and had their own spell of pressure from which they converted a penalty to tie the game up after 10 minutes. Tullamore responded well and again a series of direct drives and strong running by the Tullamore forwards saw Brian Gilligan combine beautifully with Karl Dunne for a superb score. Dunne converted and tacked on a further penalty to stretch Tullamores lead out to 13 – 3 with 25 mins on the clock. However from here on Tullamore ill-discipline allowed Seapoint a way back into the game. Leon martin was harshly adjudged to have made a high tackle and saw yellow. Seapoint were on a roll now and eventually after a several minutes of fierce pressure they battered their way over for a try to pull the game back to 13 – 8 at half time. Again Tullamore were first out of the blocks and made a positive start to the half. When Sean McCabe sent the hard running Dylan Kelso over for a try Tullamore went 18 – 8 up and things looked very positive indeed, alas this was as good as it got for Tullamore and when strongman prop Ger Molloy was withdrawn due to injury after 55 minutes it swung the momentum back in Seapoints favour. Tullamore needed to retain the ball and keep things steady but they found it hard to gain and retain possession of the ball. Further poor discipline didn’t help and when Seapoint went over from a 5 metre lineout, the game was 18 – 15 and Tullamore were under pressure. 10 minutes from time the Tullamore resistance finally caved in. Leon Martin was awarded a 2nd yellow and put off for the remainder of the game and Seapoint plunged over from a 5 metre scrum to take the lead for the first time. Try as they might Tullamore couldn’t find a way back to score in the remaining few minutes. A cruel blow, Tullamore had left everything on the pitch and come up just short. They can be proud of their performance but will know there’s much to improve on for next week. Cathal Feighery carried on from last week and was simply outstanding, while Ger Molloy was at his rampaging best before being withdrawn due to injury. Brian Gilligan continues to grow at no9 and did some very good work throughout, while Aidan Wynne oozed class in midfield and will be a huge addition this season. Karl Dunne had his best outing to date in the 10 jersey and Dylan Kelso made some strong bursts. Things don’t get any easier for Tullamore with an improving Sligo up next weekend at home in Spollenstown at 2.30pm. Still early season in an 18 game league, but already this game takes on ‘must win’ status if Tullamore are to mount a serious title challenge. S McCabe, E Farrell, T Gilligan, A Wynne, D Kelso, K Dunne, B Gilligan, R Connor (captain), G Bagnall, S Pyke, L Martin, M Kennedy, G Molloy, C Feighery, M Murphy.